Central London is the home of the tourist rip-off, quagmire of simplified and sweetened food. Ethnic food is often anglicised and caricatured. Gerrard Street, centre of London's Chinatown, used to demonstrate this and used to top it with comedically rude waiters to boot. This started to change a few years a go and many new openings are geared towards some kind of authenticity and certainly better tasting food. We've already learnt that there is Chinese food beyond Cantonese, with the arrival of the Sichuanese restaurants, Bar Shu and Snazz Sichuan. 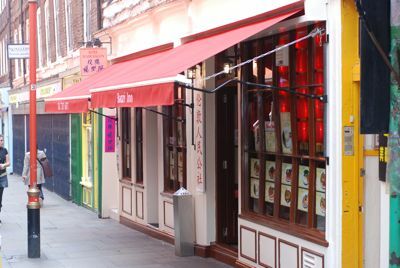 Now we have the Baozi Inn, from the creators of Bar Shu, serving delicious, good value Sichuan street food in a central London location. It's a fantastically swift and tasty place to grab a quick bite to eat. The first time I went I had two of the eponymous Baozi, these are large dumplings, fluffy on the inside. They're very filling and at £1.20 incredible value. As a super quick lunch you could go for a couple of these and perhaps the traditional millet porridge accompaniment and escape for a fiver. I followed with a portion of Chengdu Dan Dan noodles. This is a spicy pork dish . . . the noodles had a good texture and the sauce, though delicious, only really revealed itself when these had gone. With Chinese tea this was lunch for £8.70 all finished within twenty-five minutes. Great! On my next visit I tried some spicy 'Dragon' wonton, silky in texture, covered in spicy garlic and chilli oil. A crunchy seaweed salad was hard to stop eating and a main course of 'fragrant and spicy' pork noodles had that delightful Sichuan pepper heat which creeps up on you and worries you until you're accustomed to it. Throughout both these visits service was efficient and polite. So, what's not to like? It's cheap, it's tasty, it's central, it's interesting. Go. I've been eyeing this place up for a while; I really got into Sichuanese food since I got Dunlop's Sichuan Cookery. You've given me the push I needed! Noodles are OK. Baozi a bit random. Nothing like the real thing - meat one has some strange sloppy/juice sauce in it which dripped everywhere, and filling far to meagre. It's a great little place ins't it. I've just had some takeaway from lunch here for the second time although not got around to eating in yet though or blogging a takeaway. First time I had 'Hot and sour pork noodles', which were cold wheat noodles with a lip numbingly spicy cubed pork sauce and this lunch was 'Peace and happiness noodles', a bowl of soup noodles filled with small quantities of three meats and large quantites of near raw quarter cloves of garlic. Both were very good. I must eat in and I must try their dumplings and buns. I too enjoyed those Baozi Dumplings. The fluffiness on the inside is enough to make you melt into heaven. I'm planning on returning in a few days to try some Spicy "Dragon" Wanton. Excellent Restaurant that deserves 5 stars.